This package includes one Gooseneck Light Fixture. This classic barn light fixture offers both functionality and style with an adjustable shade and classic gooseneck style arm. The shade can be angled allowing the light to be used as a down light, sign light, wall washer, etc. This product includes a free 12" extension arm; which adds an additional 12" to the standard 20" gooseneck arm. 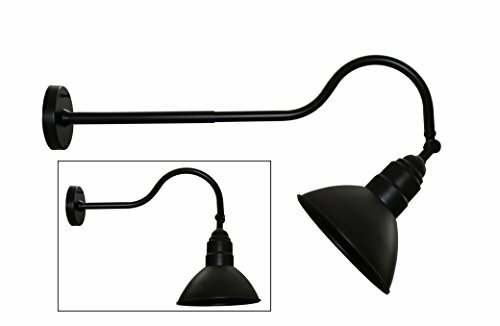 Gooseneck arm of 20" is perfect for area lighting, illuminating building façades, etc. Adding the 12" extension arm makes this light fixture ideal for sign lighting. This fixture is fitted with a UL Listed Edison Bulb Holder (E26 or E27 Base); suitable for LED, CFL, or Incandescent light bulbs (100W Max). Supplied in a matte black color finish. Wall Base Diameter 5" (130mm).Total Arm Length (Including 12" Extension) about 32" ( 810mm). Lamp Shade Diameter about 10" (250mm). Gooseneck Style Arm with Adjustable 10" Shade and Free Extension Arm. Includes a free 12" extension arm; which adds an additional 12" to the standard 20" gooseneck arm. If you have any questions about this product by Solar Illuminations, contact us by completing and submitting the form below. If you are looking for a specif part number, please include it with your message. Budweiser Three Shade Gameroom Lamp, 60"